At Tomatin distillery on October 17th 1990, a small number of bourbon casks were filled with unpeated Tomatin spirit, and left to slumber in the warehouse for around 24 years. Then, the whisky was transferred to peated Islay ex-bourbon barrels for a further four years before being married together and bottled at cask strength to create the whisky I currently have in a glass before me; Tomatin Cù Bòcan 1990. 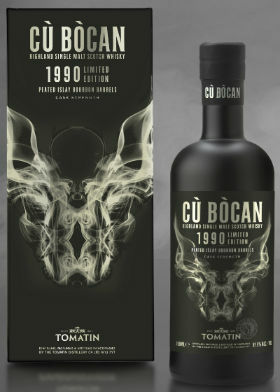 As has been described on the blog before, the Cù Bòcan is a massive, ghostly, wolf-like animal which, legend has it, has wisps of smoke coming from its nostrils and is said to stalk the woods around the village of Tomatin, which adjoins the distillery. As such, Tomatin have named their peated offerings after the Cù Bòcan legend, with the 1990 joining the 1988 which was released in 2016 and the 1989 which came out in 2014. Other younger vintages include the 2003 which is currently being rolled out now, the 2006 which was released last year, and the 2005 released the year before that. Nose: Where’s the peat? It’s all tropical to start with – toasted coconut, almond, banana yoghurt, melon, orange oil, kiwi and lime. Some white chocolate cookies too. Oh, now the smoke comes through, with a dying bonfire, burnt heather and singed flowers. There’s some sandalwood and baking spices too. Palate: Smoked limes, oyster shells, rock pools and BBQ’d prawns – very coastal to begin. Then a floral, perfumed note (violets? ), apple, pear, orange blossom and a zingy, gingery spice. Finally, wet slate, peat hearth, and hessian. Finish: Lingering woodsmoke with drying old oak logs. The baking spices reappear. Overall: Layered, complex and very enjoyable. Those Islay casks certainly provide a coastal smokiness, but they don’t overwhelm the whisky, particularly on the nose – lots of tropical fruit initially before the peat comes through. Same on the palate, with pleasing fruity/floral notes balancing the coastal freshness and earthy smokiness. Another great addition to the Cù Bòcan range, and it follows up the previous late-1980s vintages very nicely indeed. This entry was posted	on Monday, October 1st, 2018 at 10:22 am	and is filed under Reviews. You can follow any responses to this entry through the RSS 2.0 feed. You can leave a response, or trackback from your own site. We tasted the Cu Cocan at a whisky show some time ago. My husband loved it, I was less impressed. But perhaps i need to see if I can get hold of this release. It certainly sounds interesting. Thanks for your comment. The younger Cu Bocan’s are ok whiskies, but perhaps lack the depth and complexity which some of the older expressions show – I’d certainly recommend hunting out the late 1980s/early 1990s Cu Bocan expressions if you can find them!